The next time you want your dog to run wild, have a blast and make new friends, you can take them to Therpup's new pet resort, Therpup Canines Paradise. Swimming pool to boarding facilities guaranteed fun awaits pet parents and pet lovers too! Located on a massive open space, Therpup Canines Paradise is just like the name -- a paradise for your four-legged best friend, dogs! 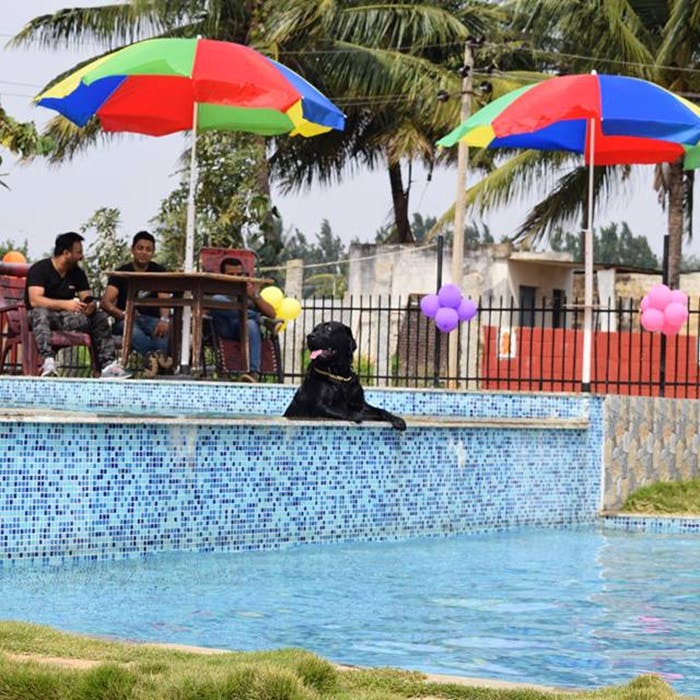 The new space, which is located a little too far from the city (it's near Devanahalli Fort), comes with a host of facilities that would make dogs and their humans happy! We are talking about two swimming pools, one for the smaller breeds and the other for the bigger boys including St. Bernards. Yup, pool time for all the city dogs who can't unleash the swimmer in them. Speaking of city dogs, parents you are going to love the massive open-air leash-free space. It has with an agility course for your dogs to run around and get their dose of exercise and adrenaline rush. No more having to be cooped up at home or going for those small walk around the apartment complex. Not to mention the fact that your dog can also make new friends to chill out with. While your doggos are chilling and having a baller time, you can chill out at the cafe or by the poolside and order anything from burgers to DIY pizzas. Training and boarding facilities are available too at the new resort if you are looking for your pets. Those with human kids, there is also a play area for them. The resort is far from the city, so we suggest making a proper plan and doing a road trip here with the squad and all your dog buddies! It's not for a quick visit. They are having New Year bash on Tuesday, 1 January and what better way to spend new year with dogs and lots of fun!